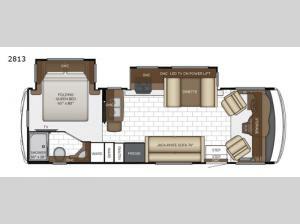 Get ready for any camping trip with this double slide out Bay Star Sport class A 2813 motor home. Seating space can be found at the driver and passenger seats as they swivel around plus the dinette and the 74" jack knife sofa can easily double as seating and sleeping space. Above the dinette there is an LED TV on a power lift. In the rear bedroom you will find a folding queen bed, overhead cabinets, an an optional LED TV.